I slept in today, even though people around me were making noise from 4:30am, I didn’t leave the albergue until 7:30am – usually I would have covered at least 10 km by this time! I wasn’t in a hurry because I had booked my albergue in Hontanas and just needed to arrive by 4pm. It was quite an adventure leaving Burgos trying to find the little yellow arrows! Today I was going to reach the “meseta.” About 40% of Spain’s land mass is made up of a high central plateau (Meseta) ranging from 400 to 1000 metres in elevation. Every guidebook describes it as boring flatlands and says if you’re in a hurry to get to Santiago then you should skip this part. I loved walking through it today! The track was surrounded by lush green fields of wheat, birds everywhere, and a path winding its way for miles in the distance. A Spanish man started walking with me for a while and once we had exhausted all of our Spanish and English words, we walked in silence. We came to a town and he asked me to stop to rest and have a coffee with him. I was so caught up in thinking I need to rush everywhere that I motioned I needed to keep going. He insisted I rest so I stopped and then found myself wondering why I was rushing when I already had a reservation for accommodation?! I think I just wanted to arrive at the destination so I could take off my shoes, have a shower, wash my clothes, hang them to dry, then finally sit down with a cerveza or vino tinto and relax! 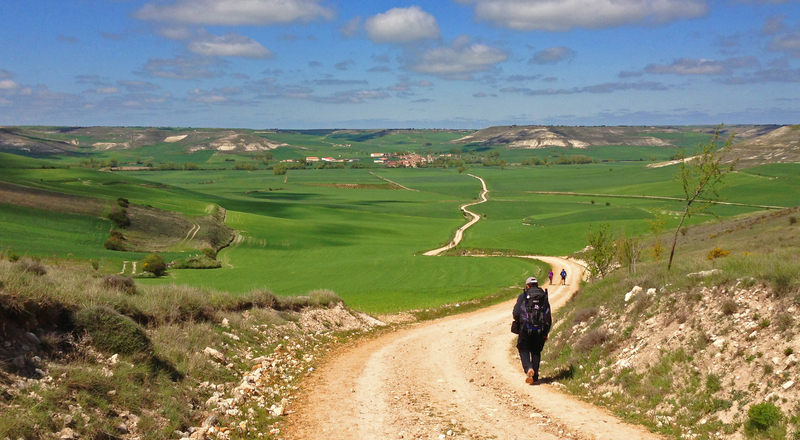 ​Unfortunately about 10 km out of Burgos I noticed my insoles were worn through which meant I was starting to feel every rock and stone that I stepped on, and that was what the track was made of! After 30 km of this track I was so happy to arrive in Hontanas. I had the communal pilgrim’s dinner and was sat at a table for 4 with 3 Germans – Gert, Andreas & Olek. We managed to drink 3 bottles of wine and have a jolly good evening! This is what I love so much about the camino, you never know who you’re going to meet and how much fun you’re going to have!